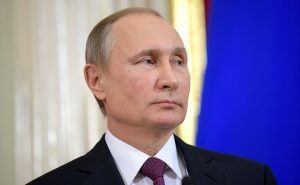 Russian President Vladimir Putin has opened a much-anticipated bridge linking southern Russia and the Crimean peninsula. The new road-and-rail bridge will be the longest dual-purpose span in Europe. Until now, Crimea was accessible from Russia only by plane or ferry. The drive took a little under 20 minutes and was covered live by Russian state television. Reporters and cameras were stationed at several spots along the route. The 11.8-mile bridge took two years to build and cost $3.6 billion. The road section is now opened to cars, with up to 40,000 passenger cars a day being able to cross the bridge. The bridge will open to truck traffic in the fall and the rail section is due to be completed at the end of 2019. Russia annexed Crimea , a Ukrainian peninsula in the Black Sea, in 2014 following a hastily called local vote. Putin claimed that ethnic Russians in the region were threatened by the country’s pro-Western revolution. Many in Russia saw the move as restoring Moscow’s rule over a historically Russian region. The West and much of the rest of the world do not recognize the annexation as legitimate. Only a handful of Russia’s allies have recognized Crimea as part of Russia. The European Union and the United States imposed sanctions on Russia for the move.